Instrument in the box to be mounted in front of the panel. LCD 5.2" TOUCH SCREEN Display. The TAIPAN 365 not only integrates weight and speed variables to generate the instantaneous flow rate per hour and the total weight, but also performs the function of automatic flow rate regulator. Ability to set, for batching, the preset, set and flight values with digital outputs upon reaching the values. Possibility of setting the SET POINT via analogue input, and having extra analogue output for effective flow rate transmission in addition to the standard regulation output. Saving of points for the working curve of the dosing system when used in combination with NON-LINEAR machines (e.g., electromagnetic extractor). Calculation of the weight total of dosed material with transmission by impulse output and possibility to deliver to a 24-column printer via RS232 port. Programming of up to 15 different set points of work, settable via BCD inputs. Freezing of the analogue output value by means of logic input, in order to present it again on restart and avoid the initial pendulation of the system (which runs all 15 set points). 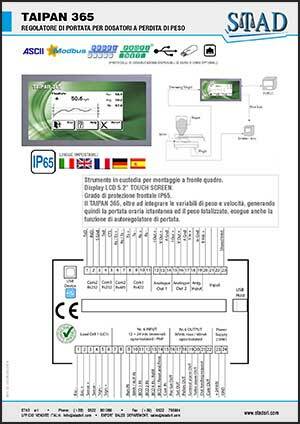 Ability to display, during operation, I/O status, current weight, instantaneous regulation and the correction factor set. It can be connected with PC / PLC using communication protocols ASCII, ModBus-RTU, Profibus (optional), Profinet IO (optional) and ETHERNET (optional). STAD reserves the right to modify product characteristics without prior notice. Click below to download software for COBRA 365. 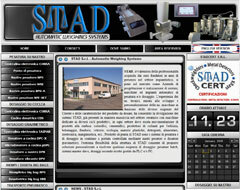 Company specialised in the design and manufacture of weighing and/or dosing systems, machines and automatic plants. The extreme flexibility of the STAD structure allows us to offer customised solutions to meet any dosing requirement: batch weighing, master-slave systems, dosing according to recipes managed by PLC and/or PC.